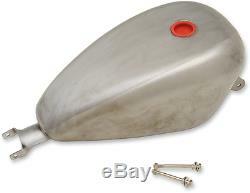 Drag Specialties 3 Gallon Peanut Gas Fuel Tank 07-17 Harley Davidson Sportster. 20" L x 11" W x 8 1/2 T. Steel gas tanks feature TIG-welded construction. Both styles measure approximately 20" L x 11" W x 8-1/2 T. Mounting tabs measure approximately 23 center-to-center. Tanks for fuel-injected models accept the OEM fuel pump, components and fuel door. Tanks for carbureted models accept 22mm petcocks. Holds approximately 3 gallons of fuel. The item "Drag Specialties 3 Gallon Peanut Gas Fuel Tank 07-17 Harley Davidson Sportster" is in sale since Saturday, May 13, 2017. This item is in the category "eBay Motors\Parts & Accessories\Motorcycle Parts\Body & Frame\Gas Tanks". The seller is "jtscycleparts" and is located in Cobleskill, New York.